At Midsummer, many people in Sweden gather on campsites. If you would like to experience the Swedish Midsummer traditions, we can recommend going to a campsite with its own Midsummer celebrations. Midsummer’s Eve starts the Midsummer weekend, and this is the day we celebrate. This is always a Friday between 19 and 25 June. 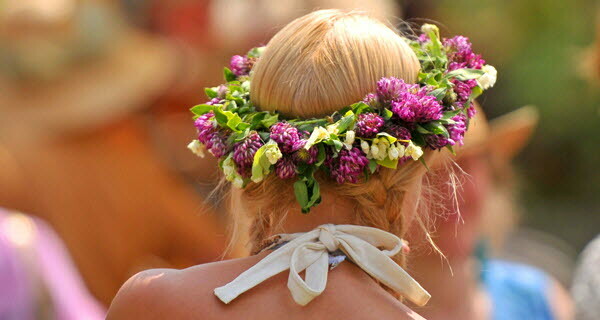 To celebrate Midsummer according to Swedish traditions you should make a wreath of summer flowers to wear on your head, then dance round the maypole singing songs such as ‘Små grodorna’. If you are in luck you can help dress the maypole with flowers and leaves and be there when it is raised. A traditional lunch is then eaten in the form of herring, new potatoes, and sour cream and chives, often washed down with schnapps. The lunch ends with tasty strawberries, often on a summery strawberry cake. 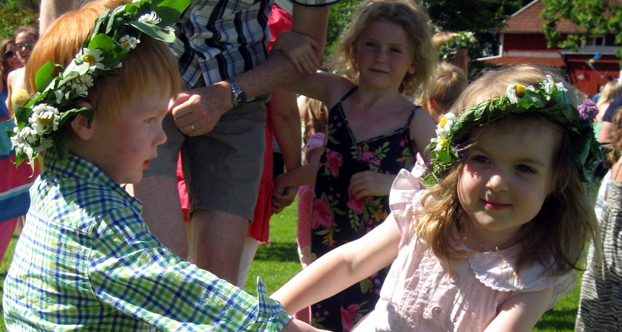 Midsummer celebrations on a campsite often include a maypole, folk musicians, lotteries, games, long tables with a shared herring lunch and children’s activities. Here we have listed all campsites located close to Midsummer celebration sites or campsites hosting their own celebrations on site.